PennsylvAsia: Pittsburgh Anime Film Series coming in February. The Pittsburgh Anime Film Series was announced today by, among others, the Deparmtent of East Asian Languages and Literatures at Pitt. 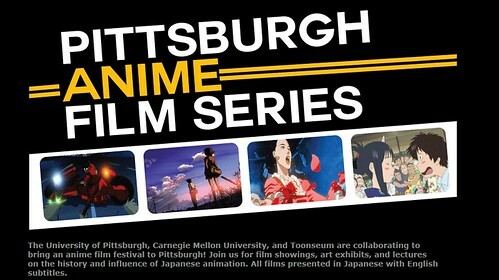 The University of Pittsburgh, Carnegie Mellon University, and Toonseum are collaborating to bring an anime film festival to Pittsburgh! Join us for film showings, art exhibits, and lectures on the history and influence of Japanese animation. All films presented in Japanese with English subtitles. All films are free and open to the public! The films playing are: Akira (アキラ) on February 5th, 5 Centimeters Per Second (Byōsoku Go Senchimētoru, 秒速5センチメートル) on February 11, Memories on February 18, and Summer Wars (Samā Wōzu, サマーウォーズ) on February 25. Most are free---all except Akira, which is free with Toonseum admission on February 5th---and all but Akira are held on the campuses of Carnegie Mellon University and the University of Pittsburgh. A lot more details available on the series' official website.